What happens when reluctance gives way to longevity? Despite early struggles with success, at 23 years in, Pearl Jam, Seattle's veteran purveyors of emotionally resonant, cathartic rock are still making albums. Still on the road. Still selling out arenas. It's as if they're compelled, that they not only believe in the saving graces of music, but also, as such forefathers like Neil Young, the Rolling Stones, and Paul McCartney are currently demonstrating, that it absolutely doesn't have to be a young man's game. And moreover, they've clearly embraced the notion that pleasing yourself is just as important as pleasing those that love you. Pearl Jam (still-impressive wailer Eddie Vedder, bassist Jeff Ament, drummer Matt Cameron, guitarists Stone Gossard and Mike McCready, touring keyboardist Boom Gaspar) arrived at the Moda Center armed to the teeth with a vast songbook, and make no mistake, friend, they are not afraid to use it. For the casual fans in the house, there were hits that might be construed as "we'd rather not play this anymore but we know you want to hear it" concessions ("Even Flow," "Alive"), nonetheless well-played with an almost offhanded ease that was evident throughout the concert. For the segment of fans in the middle (aware of the deep cuts, and relatively happy to hear them), nuggets like the rhythmic tilt-a-whirl "Deep," the simmering "Rats," and the anthemic "All Those Yesterdays" were welcome bust-outs. For those so profoundly invested in Pearl Jam's live repertoire that they probably need professional help or a side job as a statistician, well, here's a cover of the Velvet Undergound's "After Hours" (only the 4th time ever played! ); here's R.E.M guitarist Peter Buck and a reunited Sleater-Kinney helping out on Young's "Rockin' in the Free World"; and here's Riot Act's "You Are," not performed since 2011. In the latter, Vedder sings, "...you're keeping me strong/rolling along with you," a nice summation of Pearl Jam's symbiotic relationship with their audience. Lightning Bolt, the quintet's latest record, hit the music world in October with a reasonable splash and mixed reviews. An accessible if not overly remarkable entry in the scope of their discography, it was supported on this night with readings of its title track, the hyperactive "Mind Your Manners," and the lighter-raising "Sirens," an official single that has received some legitimate FM radio airplay, which seems to be increasingly rare for these guys. But if any act out there deserves listeners, it's Pearl Jam, with its hand-on-heart conviction and dead-serious approach to the art form. In a perfect universe, it wouldn't take a power ballad to grab ears, but the renewed attention is a welcome development for these craftsmen of songs born of internal dialogue turned inside out, and then forged into high-octane vehicles that can speed, do the speed limit, or simply park and gaze at the sky, however the muse dictates. 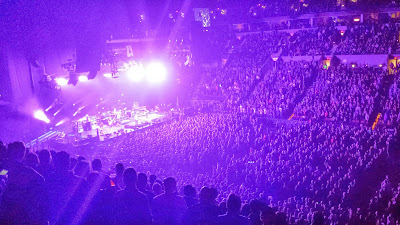 Longevity in this strange and fickle music business, though, requires survival, balance, and the conquering of hearts and minds; nowhere was this more evident at the Moda Center than at the start of the second encore with the all-voices-on-deck singalong of "Better Man." To paraphrase the song, "We need them/That's why we'll be back again." In a case of totally justifiable nepotism, Pearl Jam brought along their hometown brethren Mudhoney to open the show. Punked-out, thrashing and never blessed (cursed?) with the type of mainstream success enjoyed by their benefactors, singer Mark Arm and his crew howled and heaved in the grand tradition of the MC5 and The Stooges, with a bit of the tortured Puget Sound mixed in. Check their papers—these guys might be from Detroit.